The story of Noah’s Arc has appeared in many ancient texts, and no one doubts its veracity, though the accounts differ. The Book of Genesis in the Bible describes the boat as longer than it is wide and declares that it contained pairs of all the surviving animals on Earth. As the Zetas say, this is unlikely. 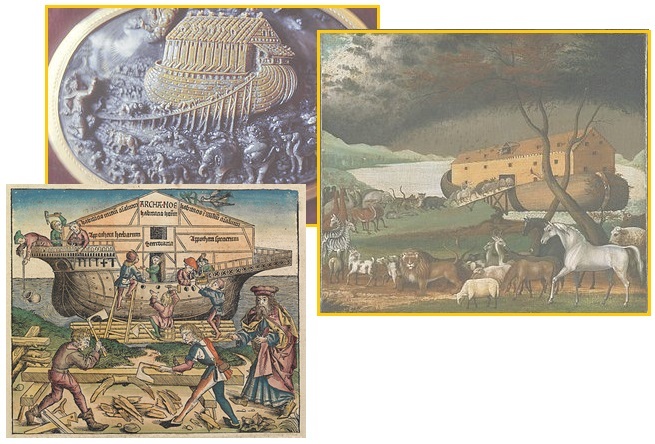 Noah's Ark is the vessel in the Genesis flood narrative by which God saves Noah, his family, and a remnant of all the world's animals from the flood. God gives Noah detailed instructions for building the ark: it is to be of gopher wood, smeared inside and out with pitch, with three decks and internal compartments; it will be 450 feet long, 75 feet wide, and 45 feet high; it will have a roof "finished to a cubit upward"; and an entrance on the side. ZetaTalk Explanation 8/19/1995: The Flood occurred three pole shifts back, approximately eleven millennia ago. Uneasy, and being a highly Service-to-Other man, [Noah] gave The Call and received visits from a Spirit Guide who responded. He did indeed construct a boat to save himself, his family, and household animals. The story of Noah has been romanticized to include all the animals of the Earth, which doesn't take much logic to dispel. How big a boat was this? Where the wave was large, it did not cover the entire Earth. How could it? Thus, there was more drowning during this particular visit of Planet X, but other than that, not much difference. In 2004 a Dutch man built an arc to the Biblical specifications (though only half as large) as Issue 249 of this newsletter details. That is indeed a large boat, and bolstered against high waves and rough seas. Dutch builder Johan Huibers is expected to complete work on the massive vessel sometime next month in what has been a staggeringly ambitious project to bring one of the best-known stories of the Bible to life. It's taken three years of his life and $1.6 million out of his pocket, but Huibers, owner of a successful construction company in Holland, says the project is a dream come true - literally. Despite his wife's misgivings, he built an ark in 2004 that was roughly half the size of the specifications listed in the Bible. He guided the craft through the myriad canals of the Netherlands, and it proved such a hit among tourists, who were charged seven bucks apiece to climb aboard, that it financed Huibers' true dream - building an ark every bit as big as Noah's. The Egyptians kept precise records, which have survived in the Kolbrin Bible. Per the Kolbrin, Noah was a nobleman, wealthy, and thus had the funds for his endeavor. He took his entire household and many skilled craftsmen. The Kolbrin likewise reports that the ship was to be bolstered against rough seas, and did not need to be concerned about navigation. It has been told to me in a dream that the ship should be built against the mountains, and the sea will come up to me. … The lowermost was for the beasts and cattle and their provender, and it was laid over with sand from the river. The middle one was for birds and fowls, for plants of every kind that are good for man and beast, and the uppermost one was for the people. … cisterns for water and storehouses for food … the ship was without mast or oars. The 2014 release of yet another version of the story of Noah, however, showed a square ship, and no others but the immediate family of Noah on board. 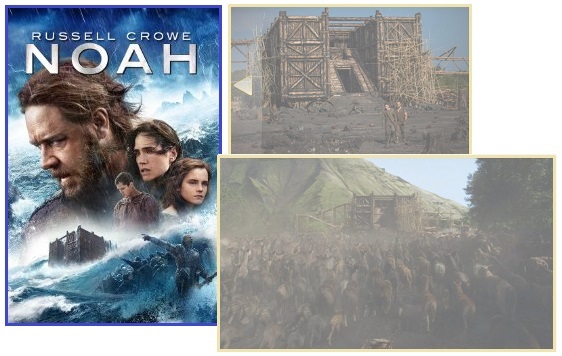 As Issue 391 of this newsletter details, the fact that both the story of Noah and the Exodus are newly in theaters, together, should not be a surprise, as both occurred during a prior passage of Nibiru, aka Planet X, and this is an attempt to educate the public on what to expect. ZetaTalk Comment 3/22/2014: The Bible is expected to become a virtual reference manual by many following the announcement, and the stories of Noah and the Exodus are clear examples of prior passages. The Book of Revelations also has a parallel in the Kolbrin, in describing the forthcoming passage. Beyond wanting to make a profit in the movie making business, the promoters of these two 2014 films hope to educate the public. Noah planned for flooding in a practical manner, building a water tight boat for his family and livestock. The message of the Exodus is that the good hearted will be assisted, while those intent on enslaving others will not. Now we have yet another shape – a circle. According to records from ancient Babylon, the Arc should be circular and built of reeds. A scaled down replica is being constructed in India and shows a correlation with the Kolbrin account in having quarters for the people on the upper level. Since the real arc has long since rotted into the landscape, we will likely never know. Is this the REAL Noah's Ark? 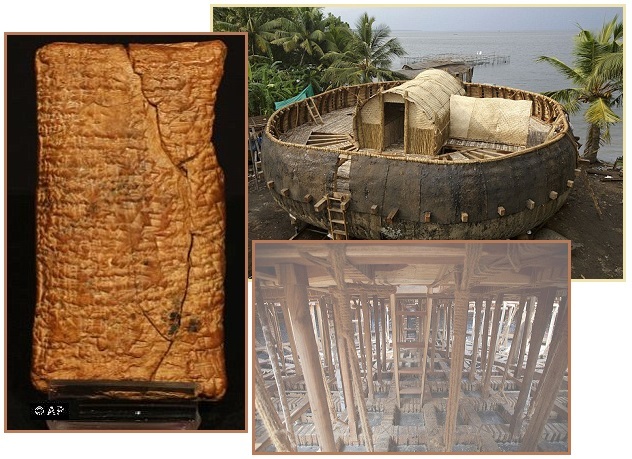 A scale model of Noah’s Ark has been built based on a blueprint drawn up in ancient Babylon 4,000 years ago. The expert behind the Biblical undertaking rocked the world last year with his controversial theory that the fabled ark was round and made of reeds. ZetaTalk Comment 1/24/2009: Noah's Ark has never been found nor will it be. The displacement wave that roared into the Persian Gulf from the vicinity of Antarctica rose into a tidal bore as it tore into the region of Turkey and Iran. Thus, it clearly overran lowland areas and rose up against mountain ranges. But it hardly climbed to the level of the top of Mount Ararat, some 16,000 feet above sea level. The precise location in the highlands where the Ark found the water no longer supporting it, being left high and dry as the waters receded, is not of importance, but the search should concentrate on rolling hills, not mountain tops. The Ark was tossed about on the roiling water and did not come to rest until the waters were steadily receding, and as the waters were not all that high to begin with, it came to rest not in riverbeds or lowlands but in the hills surrounding such lands. It was abandoned, and its wood removed to be used for dwelling places, and thus no trace of it remains today. At the start of the ZetaTalk saga, the Zetas predicted increasingly intractable drought, switching about to deluge in an unpredictable manner. There is no question this has occurred, particularly since Planet X arrived in the inner solar system in 2003. ZetaTalk Prediction 7/15/1995: As we described earlier, going into the cataclysms the weather will become unpredictable, with torrential rainstorms where not expected, and droughts likewise where not expected. ZetaTalk Prediction 7/29/2005: We warned at the start of ZetaTalk, in 1995, that unpredictable weather extremes, switching about from drought to deluge, would occur and increase on a lineal basis up until the pole shift. Recently, deluge has become intense and notable for the number of records being broken! 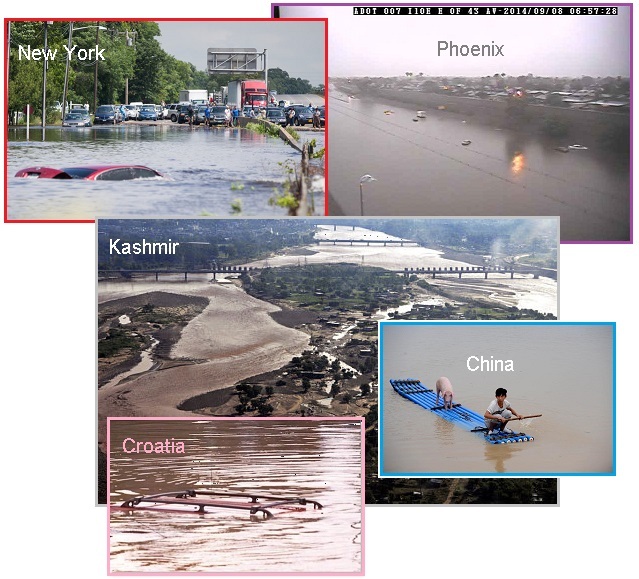 From New York City (13.26 inches in a 24 hour period) on August 13 to Phoenix (breaking a 119 year record) on September 8 to Croatia (breaking a 120 year record) on September 14 to Kashmir (breaking 5 decades record) on September 8 to China (breaking 1951 record) on August 22. In less than a month, these worldwide records were broken. Deluge indeed! A total of 13.26 inches (33 cm) was measured at Long Island’s MacArthur Airport in Islip, setting a preliminary statewide record for the most rainfall in one area in a 24-hour period. This is by far the wettest day on record in the weather site’s 119-year reporting history. Weather records in Phoenix date back to 1895. Monday surpassed the rainiest calendar day on record at Phoenix Sky Harbor International, which has received over three inches of rain since the early morning hours. The previous record of 2.91 inches was set in 1933. The worst flooding since records began 120 years ago hit the Balkans in May, killing more than 40 people. Some 35,000 people in Bosnia and 25,000 in Serbia were evacuated from their homes, and many more fled on their own. Six days of rains in Indian-controlled Kashmir have left more than 120 people dead in the region's worst flooding in more than five decades. In neighboring Pakistan, more than 205 people have died and thousands of homes have collapsed. Statistics from the provincial hydrological bureau showed that the province's average precipitation has reached 204 millimeters over the past fortnight, the highest since 1951 excluding the influence of typhoons. 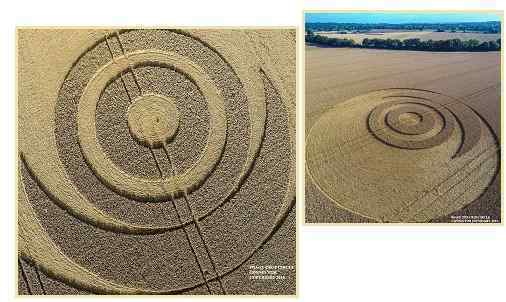 Crop circles that have displayed concentric circles or spirals have always been interpreted by the Zetas to imply magnetic fields. 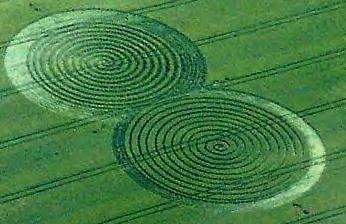 Note in the design laid at Fort Nelson in the UK on June 11, 2004, the dual circles are interpreted in this fashion. ZetaTalk Analysis 6/25/2004: Planet X remains on the flow lines of the Sun, increasingly at an angle to the Sun, causing the Earth's tilt to be more extreme, until, as magnets do, the Earth is in an extreme tilt, almost lateral to the Sun. Again, given the complexity of recent crop circles, not the last dance, but implied in Fort Nelson in the angle of the small bodies, planets, caught in the magnetic maelstrom. Then spirals began to be seen in the skies, the most famous on December 8, 2009 in Norway. Such spirals had been recorded by cave men on cave walls, in association with depictions of dead fish and a warning to rush to higher ground to avoid flooding. 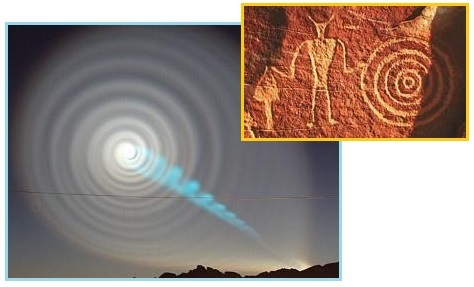 Cave men were recording a prior Pole Shift, a passage of Planet X, aka Nibiru. ZetaTalk Analysis 12/8/2009: Why the great swirl in the clouds around the swirling neon display? An electrical charge in the sky is not a static matter, as the path of lightning shows. Lightning is an accumulation between moving air masses that suddenly builds to the point where a torrent of electrons is on the move. But what if the charge does not accumulate in one place, but is constantly present over a broad area? As with all swirls that develop in nature, they start with a small movement in one place that creates a vacuum pulling matter behind it, and thus builds. Galaxies swirl. Water going down a drain swirls. And these large charged atmospheric swirls are chasing after some part of the tail waft that is more or less charged than the surrounding atmosphere. What are we to make of the almost exact duplicate of the 2004 Fort Nelson design being seen in the skies in recent photographs of the Planet X complex! This photo capture was made on September 15, 2014 at 7:45 am, as posted on the Pole Shift ning blog for such captures. 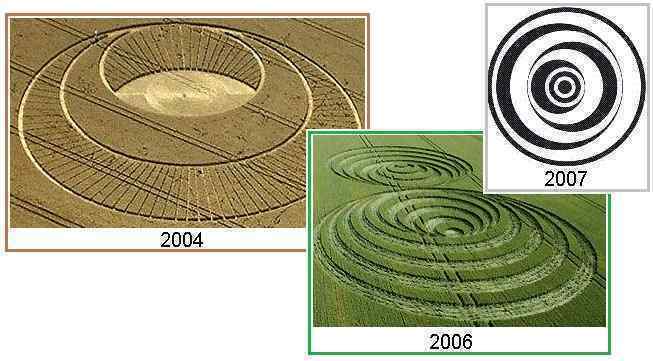 Is this not the 2004 crop circle design depicted in the photo of the Planet X complex? 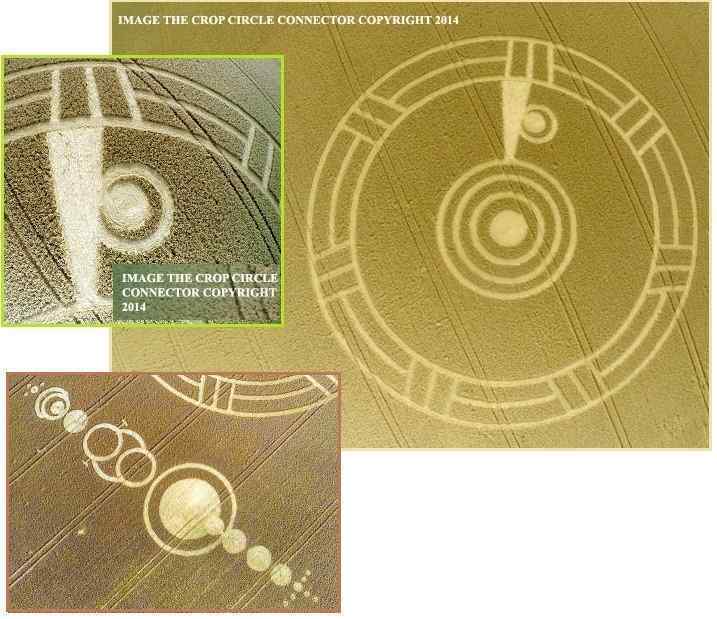 Crop circle designs during August/September, 2014 have been emphasizing a magnetic clash. In Stadskanaal, Northern Holland on July 25, 2014 a clearly magnetic design was laid, which per the Zetas is warning of an unrelenting magnetic interference on Earth until the passage has completed. 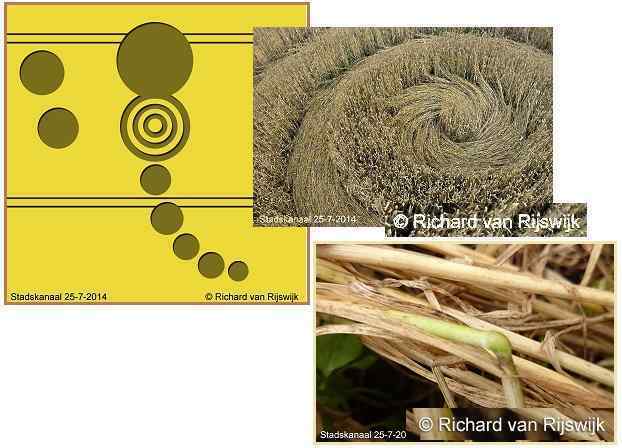 ZetaTalk Analysis 8/2/2014: This is a clearly legitimate crop circle design, with grain bent at the nodes and interwoven swirls. 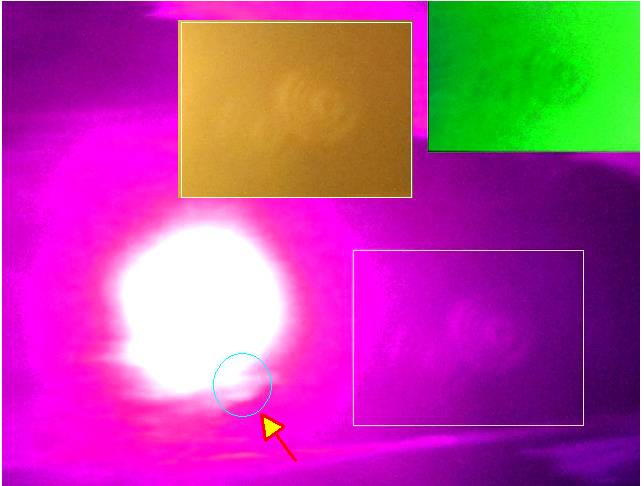 The most outstanding feature is the two orbs touching each other, one emitting outbound waves. Where the Earth has been affected by the magnetic hosing coming from Planet X over this past decade, and by licks of the wafting tail, this has been intermittent. This design is saying this situation will no longer come and go, but will remain until the passage has occurred. Mankind will find their problems with electromagnetic pulse and flux increasing, and the wobble increasingly violent, with no relenting. Venus and the Dark Twin, which are not magnetic, are not caught in this dance. On Ironwell Lane in the UK on August 24, 2014 another magnetic design was laid, this time showing the Earth’s magnetosphere pressed to one side. Per the Zetas, This design will be subconsciously understood by those viewing it, as problems with planes going off radar, GPS systems malfunctioning, and electrical glitches have been afflicting mankind of late. ZetaTalk Analysis 8/30/2014: We have, during our crop circle analysis, ascribed concentric circles to a magnetic influence or clash. This can be seen in 2004 as Planet X approaches the Earth from below the Ecliptic, not aligned straight up with the Sun’s field and therefore creating a daily wobble in the Earth. This can be seen in 2006 in the design depicted clashing fields. And this can be seen in 2007 with the battering effect that the daily polar push by Planet X has upon the Earth. So what does the 2014 design at Ironwell portray? There is an intense one-sided squeeze, the magnetic field of Planet X compressed where it encounters the Earth, the overall impression one of unrelenting intense magnetic pressure, which is expressed in so many of the Earth changes mankind is dealing with at present – planes disappearing from radar, GPS satellites malfunctioning or not accessible, and electrical appliances turning off erratically. There are few among the populace who will miss the meaning of this recent design, as the fact that the Sun and Moon are not in the skies in their expected position is subconsciously noted, even if a taboo subject in the media. Then in the Ark Lane design in the UK on August 29, 2014 the magnetic clash and a magnetic timeline were depicted. Per the Zetas, the dramatic block in front of the hapless Earth shows there is no going back or relenting. The magnetic interference Earth must endure will only get worse until the passage is complete. ZetaTalk Analysis 9/6/2014: The fact that the crux of the Ironwell circle design (laid in the UK just six days earlier) is within this newest UK design indicates that both designs are about magnetics. Interference with the Earth’s magnetosphere will no longer be influenced by the magnetic trimesters, occurring three times a year. The interference will now be continuous, unrelenting, the magnetosphere of Planet X literally abutting the Earth’s field, their magnetospheres clashing and touching, as many recent crop circles have shown. This interference is indicated by the spike before the hapless Earth in the Arklane design. What of the addition, laid some days after the original? This is a timeline design, giving the history of the magnetic effect of Planet X upon the Earth. First, at the right, it was far out in space and had a minimal effect on the Earth’s magnetosphere. Then as it entered the inner solar system in 2003, from below the Ecliptic, Planet X pointing its N Pole toward the Sun’s S Pole, Planet X began causing the Earth to wobble which began in 2004. When Planet X was close to the Sun, passing the Sun, it swung its magnetic S Pole outward toward the Earth, its magnetic N Pole virtually glued to the Sun’s S Pole. Thus, its magnetic influence was temporarily diminished. Having passed the Sun and well on its way outbound, Planet X went into its first 270 roll, causing the Earth to have an increased wobble. During this time, the hapless Earth is still trying to align, magnetically, with the Sun. Thus the polar pins. At present we see the familiar magnetic squeeze design, where the Earth’s magnetic field is touching that of Planet X. The inference is that the Earth will lose its alliance with the Sun during this time, the Earth wobble going into gyrations at times, trying to align with Planet X and then swinging back to align with the Sun. After the Pole Shift, the magnetic influence of Planet X will return to being minimal.